What makes a work of art or literature memorable is not only the craft involved, but its truth. A work doesn’t have to depict “real” events to ring true. Just recently, an example came up when I read a book by Daniel Silva, the bestselling writer of a series of thrillers based around a fictional Mossad agent and art restorer, Gabriel Allon. In Silva’s “The English Girl,” a minor and authentic detail from the book offers a hint to the beginnings of Israeli art. A walk in downtown Jerusalem brings you to the street of the purported home of art restorer and Mossad agent Gabriel Allon, Silva’s protagonist and hero of many of his novels. Silva, in his afterward, makes a point of mentioning that the Mossad never used that apartment and that the connection is purely fictional. In “The English Girl,” Allon’s apartment is set in a building at 16 Narkiss Street – which as of this writing doesn’t exist. However, besides that clever touch, it is not by coincidence that Silva placed Allon’s home on “the quiet leafy lane” known as Narkiss Street. Narkiss is Hebrew for narcissus, however the street is not named for the flower. The placement of Allon’s apartment on this street, as many of the references in the book, was not chosen by chance. 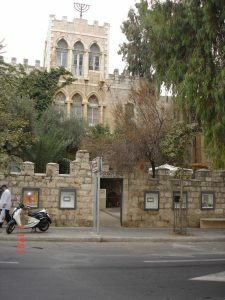 As Silva himself writes, the apartment’s location is very close to the Bezalel Academy of Arts and Design, where Silva’s hero Allon studied, and in fact, the original Bezalel building is located around the corner on today’s Shmuel HaNagid Street. The Bezalel school was founded in 1906 by a Lithuanian Jewish sculptor named Boris Schatz (1866-1932). Schatz, the epitome of a peripatetic Jew, studied in Russia and Paris. His sculpture of Mattathias, the father of the Maccabees, made a strong impression on the Prince of Bulgaria when he saw it in Paris in 1895. Bulgaria had become independent only in 1878 and was in the process of defining itself as a nation. The Prince invited Schatz to come and establish a school of national art there. Schatz’ mission in Bulgaria held within it the seeds of personal tragedy—his wife ran off with one of his students, taking their daughter with her. However, his time in Bulgaria also held within it the seeds of his future. In 1903, Schatz would convince Theodor Herzl, father of the Zionist movement, that the new Jewish homeland needed an art school. And so in 1906, Schatz set off for Jerusalem with a few teachers, his experience in Bulgaria, and a dream. Schatz saw himself as part prophet, part adventurer rolled into one – and was often seen dressed in the incongruous combination of a long white jallabia and a pith helmet. Ever cognizant of the importance of symbols, Schatz chose to name the school after the Biblical Bezalel ben Uri, the first Jewish artist, who built the Tabernacle (Exodus 31:1-5). The school moved to it historic building in 1908. Schatz established over 30 departments there — many of which taught crafts, such as rug-making and basketry, to help the Jews of Jerusalem become financially self-sufficient. In addition, Schatz began to collect art and archaeological artifacts, as well as plants and animals, both alive and stuffed, so that the students could draw inspiration from their surroundings and incorporate the local flora and fauna in their works. This collection was formalized into a museum in 1925 under the curatorship of Mordechai Narkiss (1898-1957). Narkiss was from Poland, and like many of the early Zionists, took on a Hebrew name–in this case the name of a fragrant flower, appropriate for one who made art his life’s work. This humble museum’s art and ethnography collections later formed the kernel of today’s Israel Museum, established in 1965. Schatz was an indefatigable promoter of Bezalel, and traveled endlessly to sell Bezalel wares and raise money. My family owns a spice box made in the Mandate years at Bezalel that was probably purchased by my grandparents at one such sale. The shape of this olive wood spice box is clearly based on Absalom’s Pillar, a first century BCE funerary monument located at the foot of the Mount of Olives. pre-State period, offering tangible anchors to the Land of Israel and the Zionist enterprise. Schatz had mixed his own finances with that of the school and this disorder ultimately resulted in the school’s bankruptcy and closure in 1929. Schatz did not give up, however, and while making a last ditch effort to raise funds in order to reopen the school under his stewardship, he died in Denver, Colorado. It took six months to raise the money to bring his body back to Jerusalem. 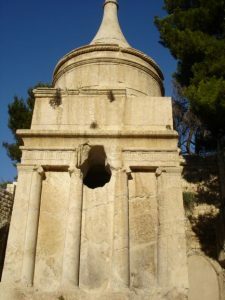 Schatz’ final resting place is located on the Mount of Olives, near the Ben Yehuda family. 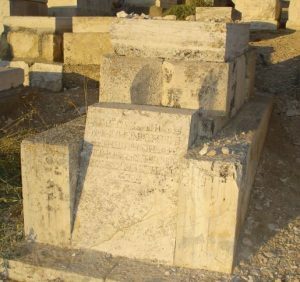 Part of his epitaph reads: “Here lies, until the end of days, Professor Boris Schatz, the creator of Hebrew art in its homeland, for which he went through the crucible of suffering and fell, far from the Jerusalem he loved.” Fortunately, the story of Bezalel did not end with Schatz’ death. The Bezalel Academy reopened in 1935 in the format of a more modern art school, and continues to thrive to this very day. In the early 1980’s, the school relocated to the rebuilt campus of the Hebrew University at Mount Scopus, which had been forced to close in 1948. Today, the wheel turns again, and Bezalel is in the process of moving back to downtown Jerusalem. The Architecture Department has already returned to one of the original buildings. To bring us back to the “house” of Gabriel Allon: the streets of Jerusalem are named by a committee, often choosing a theme for a specific locale. 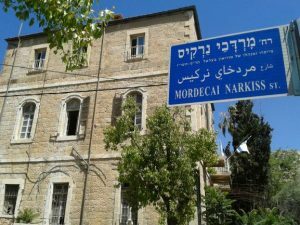 It is therefore no surprise that the street next to the old art school building is Bezalel Street, nor that the one leading up to the Bezalel building from King George Street is named after Schatz, or that the street around the corner is named for his devoted assistant, Mordechai Narkiss. Schatz’ dream of art in Jerusalem ultimately came true-the Jewish people became artists again in their land. Some of these also became reluctant warriors, as did Silva’s protagonist. So should you visit Jerusalem, take a walk downtown to the old Bezalel Building which now houses Jerusalem’s Artist’s House and a restaurant, and think of the visionary Schatz, his assistant Narkiss, and…Gabriel Allon.